This month on Instagram, I have teamed up with 3 other ladies to bring you a swimwear challenge, #SewSwimSocial! Swim and beach season is upon us and we want you to grab your supplies and sew swimwwear for anyone: you, your kids, your husband, even your dog, lol! But really, this challenge is intended to provide you with a little confidence to to sew yourself some swimwear that fits. Please follow along with me, and the other Instagramers on their accounts: Emily @replicatethendeviate (her blog is here), Meghan @joyfulemon and Crystal @crissybellsews as we sew up swim for ourselves and our children. We have teamed up with some amazing fabric shops and swimwear pattern designers to bring you weekly giveaways! Please tag your entries for the grand prize using hashtag #sewswimsocialfinal – complete details for the contest can be found on our individual account feeds. I’ve been sewing since I was a child, but my first experience sewing swimwear was in 2012, right after I finished college. I was desperate for a swimsuit that fit and RTW sure didn’t. It was expensive, didn’t come in prints I liked, and did not fit my small bust. Simply put, I wanted to sew swimwear because I couldn’t find anything I liked in my size, that addressed my fit issues. I wanted a suit that was comfortable and that I felt confident and pretty in. It was a tall order, but I was up for the challenge! I learned to sew swimwear mainly thanks to some pattern reviews and tutorials posted by other bloggers I followed. Even though I had some resources, the task seemed daunting. Would my first project be wearable? Would the fabric slip and slide under my presser foot? What kind of materials would I need? I’m happy to say that I charged on and have made mistakes, had successes, and have learned from both. Since then I have sewn up 7 swimsuits for myself, and at least 4 for my daughter. Ha! I just counted them up last night – it’s hard to believe it’s that many!! I truly believe that anyone who knows the basics of sewing, and has several garment projects under their belt, can sew swimwear. Below I’ve compiled the essential tips for selecting swimwear materials and gathering supplies so you can start your journey to a me made suit! 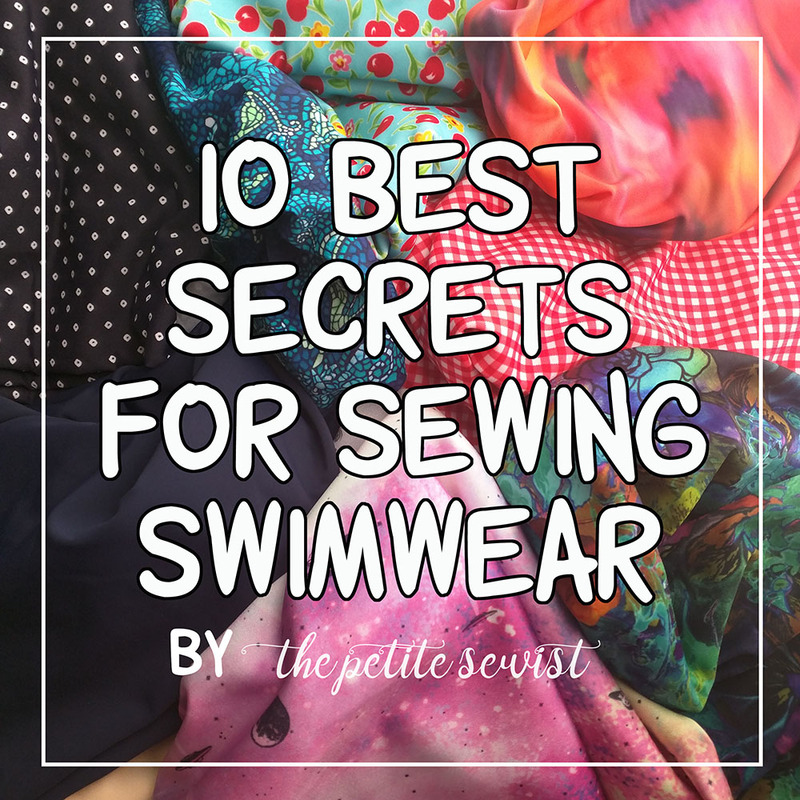 The 10 Best Secrets for Sewing Swimwear – Tips to Jumpstart Your Summer Sewing! 1- You don’t need a serger to sew swim knit. I know a lot of people who are hesitant to sew swim knits, and knits in general, because they don’t have a serger. I, myself, waited to really get into sewing swimwear until after I purchased my first serger. What a waste of time! Especially because I’ve found that I still prefer to use my sewing machine!! 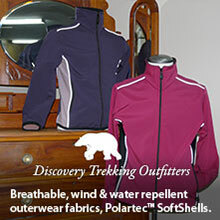 When shopping, look for sections labeled ‘swim knit’ or ‘activewear’. A good swimwear fabric will contain approximately 10% spandex and should have 4-way stretch. Please avoid the swim knits at your local big box store. I’m all for a good deal, but they are often thin and very slippery = very hard to control under the presser foot. I made a swimsuit one year out of discounted fabric and it stretched out far too quickly. I wish I’d spent more and not wasted my time on something that wouldn’t last. I look for swim knit that is either nylon/spandex or sometimes polyester/spandex. Both of them have products engineered to be chlorine/saltwater/UV resistant. This information is not always available, but I at least like to make sure that my fabric will be chlorine resistant. You don’t always need to line your swimsuit fabric, but it is recommended for extra coverage underneath swimsuit fabrics that are white or lighter weight. Lining should be soft and have 4 way stretch. Lining should have roughly the same amount of stretch as your swimsuit fabric. Most shops that sell swim fabric will also carry swim lining. Provides extra support, and is used in areas such as the bust, and the torso and sometimes swim bottoms. When sewing swimwear, you must use polyester thread. Cotton thread is not advised because chlorine will weaken it. I usually use a good all-purpose thread (those are usually contain polyester) and my favorite is this Gutermann thread! You will need special swimwear elastic, regular polyester elastic will not do. I have used this cotton covered elastic for years. 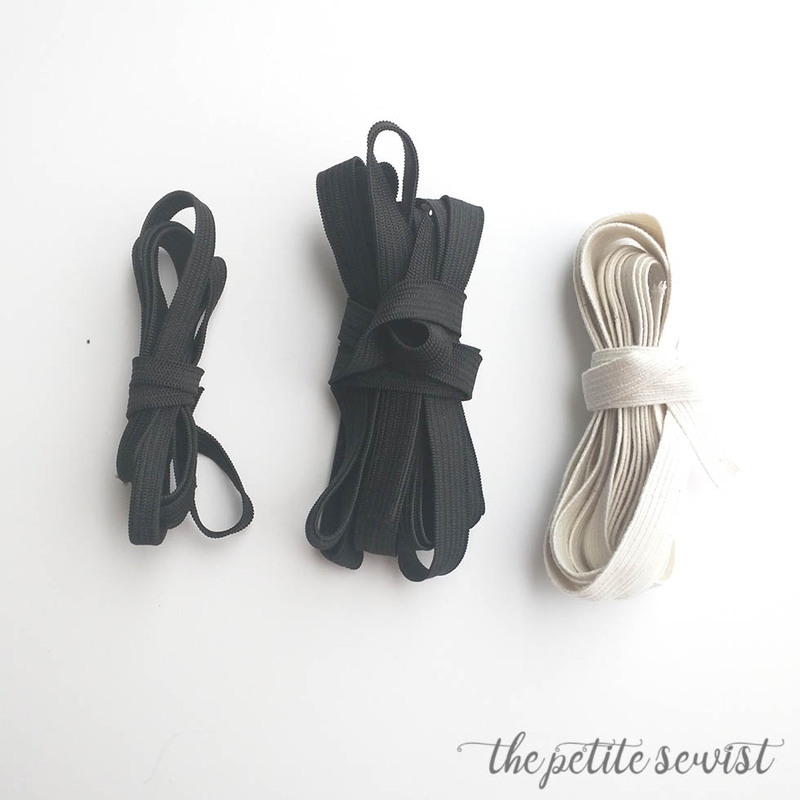 I tried The Fabric Fairy’s swim elastic this year and I like it even better! Any time you sew with knits, you needles specific to sewing with knit fabrics. JERSEY or SRETCH needles are beveled on the very edge (unlike universal needles which come to a sharp point). I use STRETCH needles for jersey and swim knits, heck I use them for all my knits. I recommend SCHMETZ or KLASSE needles for all my projects. This stitch card is from my Babylock machine. The straight stitch will not do, you will need stitches designed to stretch with the garment as you move. Some great options for sewing seams are: your basic zig-zag stitch, a lightning bolt stitch, and a triple stretch stitch. 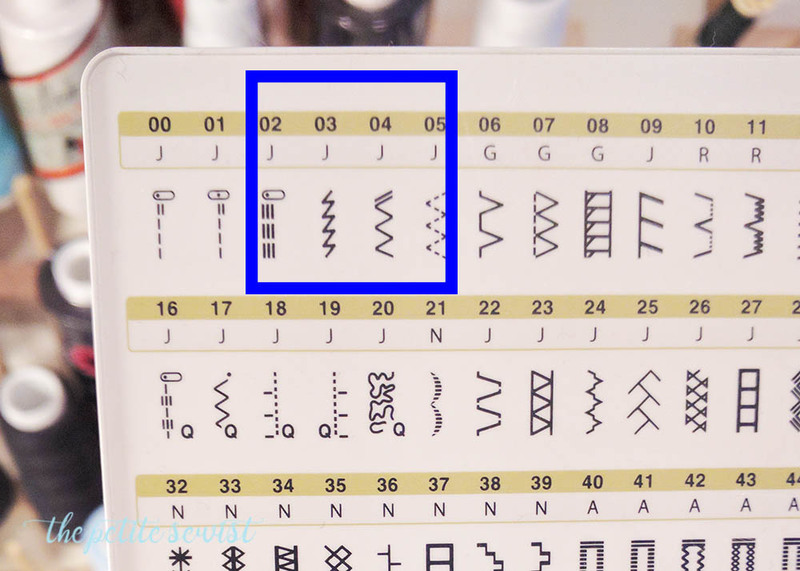 Not all machines have the last two I mentioned, but every sewing machine should have a zig-zag stitch. Great stitches for inserting elastic are: the zig-zag stitch, and the 3-step zig-zag. You can topstitch with either a zig-zag stitch, or bust out your twin needle for a more professional look. (A straight stitch setting should be selected). It sews two lines of straight stitches on the top, and a zig-zag on the bottom. 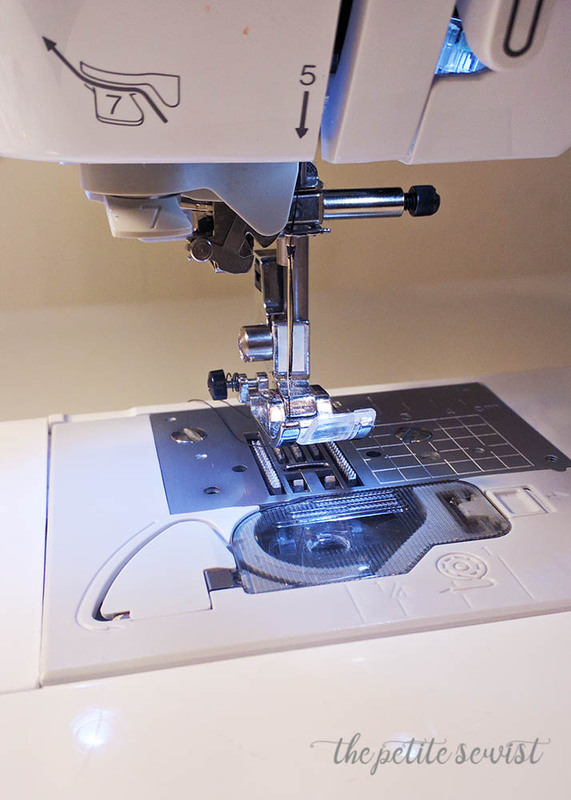 If you happen to have a serger/overlocker, you can use the 4 thread overlock to sew the seams. A coverstitch makes for really nice topstitching! Everyone likes the ta-tas to look amazing in their swimwear! You can purchase thin foam cups (specifically for swim) for modesty and a bit of light support. Shops that carry a lot of swim (including The Fabric Fairy) often sell these, so you can purchase them in one stop! If you are larger busted, you may find that foam cups don’t provide the support you need. You can learn how to insert one of your bras into your swimwear in this Craftsy class about the Supportive One-Piece. **Tip for Small-Busted Gals** (Because I love ya! ): I am small-busted…and I mean really small. Most of the time foam cups are sold in combined sizes (like A/B and C/D). If you are a AA, you can buy an A/B/ cup and cut ¼” off around the edges. You’ll want to zig-zag around the edges when you’re done. 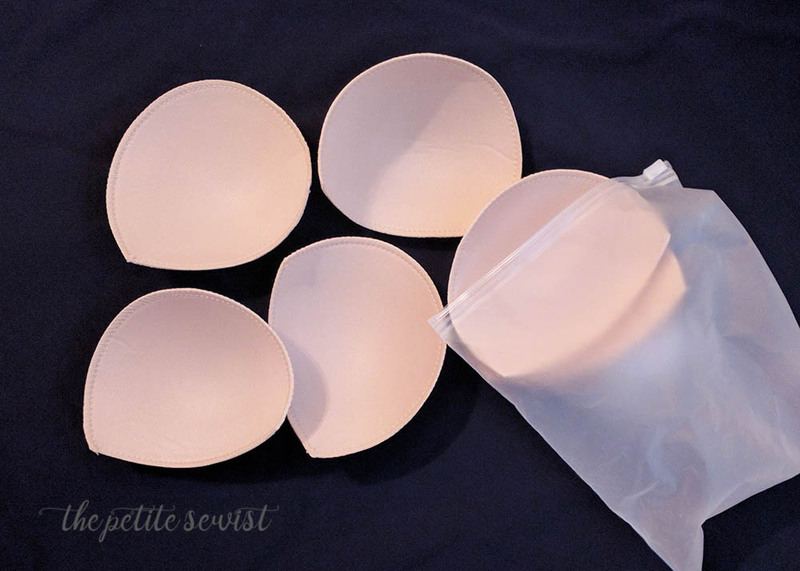 If you are small busted and prefer a padded bra, the thinner foam cups may not give you the shape you are used to in a padded bra. The cups pictured above are soft and give me the shape I need to fill out the bust area on my swimsuits! Like with other knits, you’ll need to pay attention to which direction you cut out your fabric. Many swim patterns have a label that shows to place the pattern piece on the greatest degree of stretch. This will ensure that the fabric stretches across your body so that it will fit when you put it on! I hope these tips help you see that anyone can sew swimwear! If you need more swimwear inspiration, check out the Ladies’ Gallery or the Childrens’ Gallery, here on my blog. If you have other great tips for sewing with swimwear, please COMMENT BELOW and let us know where you find all your great materials!